Dec. 29, 2018—It's New Year's resolution time. If you've resolved to be more active in 2019 but you're not sure how to cope with the cold, these 10 winter workouts can help keep the weather from freezing out your commitment to moving more. Take a dip. Don't wait for summer to dig out that bathing suit. Swim some laps at your community center's indoor pool for some easy-on-your-joints, low-impact exercise. Play in the snow like a kid. Grab a sled, and head for a steep hill. The walk up is your workout—the slide down, your reward. (Remember to sled safely: Wear your helmet.) For a great shoulder workout, throw some snowballs or build a snow sculpture. Even making snow angels gets your blood pumping. No snow? 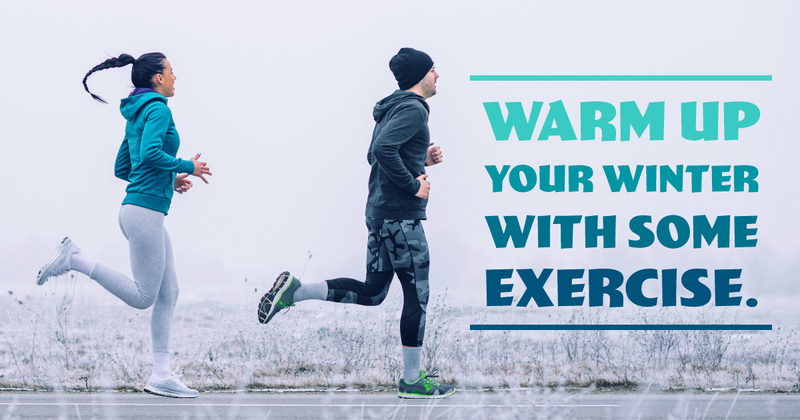 Bundle up and walk (or jog). Going uphill may help keep you warm. Or do a circuit. That means stopping every 5 to 10 minutes to do a 30-second set of squats, lunges or pushups. Sign up for an indoor sports league. Volleyball, soccer, basketball—pick a sport you loved as a kid, or try something new. With your team members counting on you to show up, your motivation won't dip along with the temperature. Scale some heights. Feeling adventurous? Try out a climbing wall at a gym or sporting goods store. Shovel white stuff. Shoveling snow burns about 100 calories every 14 minutes. Why not help dig out a neighbor the next time it snows? But check with your doctor first if you have a medical condition, don't exercise regularly, or are middle-aged or older. Take the TV challenge. Whenever you watch, turn commercials into mini-workouts: Jog in place, or do crunches, pushups or squats. Count stairs. Are there stairs at your workplace? Then challenge your co-workers to a friendly competition to see who climbs the most steps in a week. Turn your home into a gym. No need to venture out in the cold. Even with limited space, you can get a full-body workout with an exercise video, hand weights and resistance bands. Using apps and streaming videos can help keep you out of a rut. Lace up. Ice skating isn't just for kids. So head to your local rink. Bring a friend and help each other improve your balance.